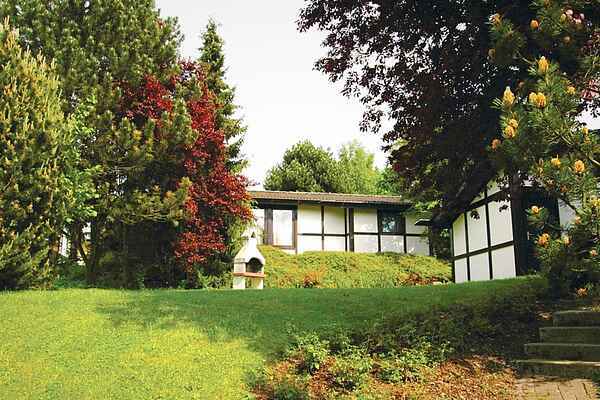 The cosily furnished bungalow is located in a beautiful holiday park on a western slope just above the Hennesee. Between the park and the lake there is a public sunbathing lawn with natural bathing beach. Enjoy the lovely panoramic view sitting on the covered terrace or use the garden for sunbathing. Here you'll find tranquillity and pure relaxation. Aroung the Hennesee there are many sporting and leisure options, for ex. tennis, sailing, rowing, fishing, surfing, swimming in the lake and in the indoor swimming pool with sauna and solarium. In the winter skiers will find good conditions in the nearby Bödefeld with lift and floodlights. But there are also other excursions in the region: Winterberg sport arena (30 km), Fort Fun amusement park.